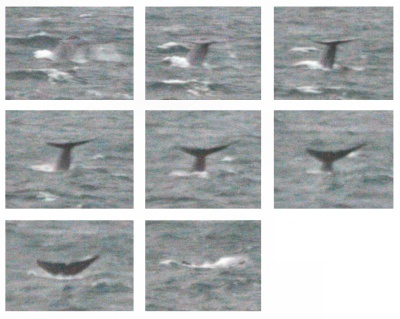 We have just heard back from Richard Sears of Mingan Island Cetacean Study (MICS) Research Station in the Gulf of St. Lawrence, regarding the blue whale photographed by Ivan O' Kelly in Irish offshore southwest waters on 15th Sept 2008. The MICS co-ordinate the North Atlantic blue whale catalogue, and have a database of several hundred recognisable blue whales from countries as far afield as the US, Canada, Greenland, Iceland, Norway, Azores and Mauritania. Having run all the available images of this Irish blue whale through the software, they are satisfied that #BWIRL1 has not been previously photographed and is a new animal, which will now be added to the North Atlantic catalogue. Reports from Bord Iascaigh Mhara on their return from a exploratory tuna fishing trip suggest a third sighting of blue whales around 6o nmls south of the first sighting. Peter Tyndall and Ronan Cosgrove reported seeing a very large whale fluking amongst a large group of fin whales. This behaviour strongly suggests the animal was a blue whale. Having waited so long for a blue whale sighting, to receive two seperate sightings of this flagship species from two different areas over a three day period would seem to belong to the realm of fantasy, but this is exactly what has happened. This weeks sightings raises many fascinating questions. Were these always out there, but just nobody seeing them? Or is there an actual increase in blue whales passing through our offshore waters, or do these sightings reflect a change in their distribution? Answers on a postcard! On Monday 15th Sept Kerry Marine Tours www.kerrymarinetours.com/ of Cahirciveen organised a pelagic trip to offshore shelf waters, primarily in search of the albacore tuna which have been well documented on this site in recent week. On board was IWDG Dublin member Ivan O' Kelly who has been in recent weeks taking part in these exploratory fishing cruises, which have taken in a whale watching component as and when opportunities arised. http://www.iwdg.ie/article.asp?id=2110 , fin whales were found associating with the tuna and as BIMs research have shown, both species appear to be feeding on Euphausiid species of krill. On Monday afternoon 15/09/08 at least one and probably two very large whales approached the MV Atlantic Explorer at close enough range for Ivan to secure images using a 300mm lens. Ivan as per usual forwarded these images and details of the sighting to IWDG, not quite realising the importance of his discovery. The images started arriving by email yesterday afternoon, and it was clear that among the fin whales he had photographed he had also secured images of a different species, which we can confirm are blue whales. He had captured them so well on film that it may even be possible to attempt to Photo Identify at least one of the blue whales. Identification was confirmed by their very pale colouration, unique mottling pattern and the thick muscular column which runs along their back. Later images also showed their diagnostically tiny dorsal fin...which is the only "unimpressive" feature of the planets largest whale.